Background: Heart failure with reduced ejection fraction (HFrEF) has growing prevalence, especially in postmenopausal females. Heart failure reversal therapy (HFRT) is a combination of Panchakarma and allied therapies used by Ayurveda physicians for chronic heart failure patients. This observational study was done to evaluate HFRT in HFrEF-affected postmenopausal females. Materials and Methods: The study was conducted between January 2015 and December 2017 at a Madhavbaug Hospital in Khopoli, India. The data of HFrEF patients who were administered HFRT twice over 7 days in hospital were considered. VO2 max, distance covered on 6-min walk test (6MWT), weight, body mass index (BMI), abdominal girth, heart rate (HR), and blood pressure (BP) were compared to day 1 and 90 of HFRT. Results: Twenty females were enrolled with a mean age of 64.2 ± 4.38 years. There was a significant improvement in mean VO2 max (12.30 ± 2.12 vs. 13.45 ± 2.10, P < 0.05) and mean distance covered after 6MWT (319.5 ± 92.1 vs. 369.5 ± 91.39 m, P < 0.05) of patients on day 90, when compared to day 1 of HFRT. Mean weight (55.20 ± 7.23 vs. 51.48 ± 6.70 kg, P < 0.05), mean BMI (22.51 ± 3.10 vs. 21.45 ± 2.47 kg/m2, P < 0.05), and mean abdominal girth (86.05 ± 8.57 vs. 81 ± 8.65 cm, P < 0.05) were decreased at 90 days after HFRT therapy initiation. BP and HR were reduced but not significantly (P > 0.05). Conclusion: HFRT effectively increases the VO2 max, distance walked on 6MWT and decreases metabolic parameters in postmenopausal HFrEF patients. Globally, cardiovascular diseases (CVDs) which include chronic heart failure (CHF), coronary heart disease (CHD), strokes, cardiomyopathy, and other heart diseases represent the leading cause of mortality. It was estimated that there were 16 million deaths from CVD, 13 million of which occurred in low- and middle-income countries, compared to 3 million in high-income countries. In South Asia, CHD was reported to be the most common cause of death, accounting for 6.8% of all deaths. A study carried out in the Indian state of Tamil Nadu found that 41% of urban male deaths and 37% of urban female deaths were due to CVDs. Among the many CVDs affecting the population, CHF has been a serious public health problem, with a prevalence of over 5.8 million in the USA and over 23 million worldwide. In India, an estimate of 1.3–4.6 million people are affected by CHF, which means a prevalence of 0.12%–0.44%. CHF is classified into two major types based on the functional status of the heart: heart failure with preserved ejection fraction (HFpEF) and heart failure with reduced ejection fraction (HFrEF). HFrEF is a clinical syndrome of shortness of breath, intolerance to exercise, and/or edema resulting from an impairment of blood ejection from ventricles, usually documented by a left ventricular ejection fraction of 40% or less on echocardiography. The age-standardized prevalence of HFrEF was 3.8% for women and 4.6% for men. Dunlay et al. have mentioned in one of their studies that about 50% of patients with CHF have HFrEF. Pharmacological management of CHF includes pharmacological agents such as angiotensin-converting enzyme inhibitors, angiotensin receptor blockers, beta blockers, antiplatelets, diuretics, and vasodilators. However, despite improvement in therapeutic drugs and devices, the prognosis of CHF is poor. The critical therapeutic benefits are those that sustain and stabilize the patient's limited functional abilities and ameliorate patient comfort. Ayurveda physicians propose using conventional drugs in the acute disease phase while in CHF, use of Panchakarma therapy (a 5-step process for providing internal body purification) has been recommended as an add-on therapy. Heart failure reversal therapy (HFRT), previously known as Sampurna Hruday Shudhikaran therapy, is an amalgamation of herbal treatment with Panchakarma and allied therapies. The techniques used in Panchakarma are Snehana (external oleation), Swedana (passive heat therapy), Hridaydhara (concoction dripping treatment), and Basti (per rectal drug administration), which are known to purify the human body from toxins. However, there is a lack of scientific evidence which supports the use of this treatment in postmenopausal female patient with reduced ejection fraction. Hence, we planned an observational study to evaluate the efficacy of HFRT in postmenopausal female patients with heart failure, with reduced ejection fraction. The efficacy of HFRT program was evaluated using various variables such as VO2 max, weight, BMI, abdominal girth, heart rate (HR), systolic blood pressure (SBP) and diastolic blood pressure (DBP), and the distance covered in 6-min walk test (6MWT). This was an observational study, with the patients treated by HFRT between January 2015 and December 2017 being considered. 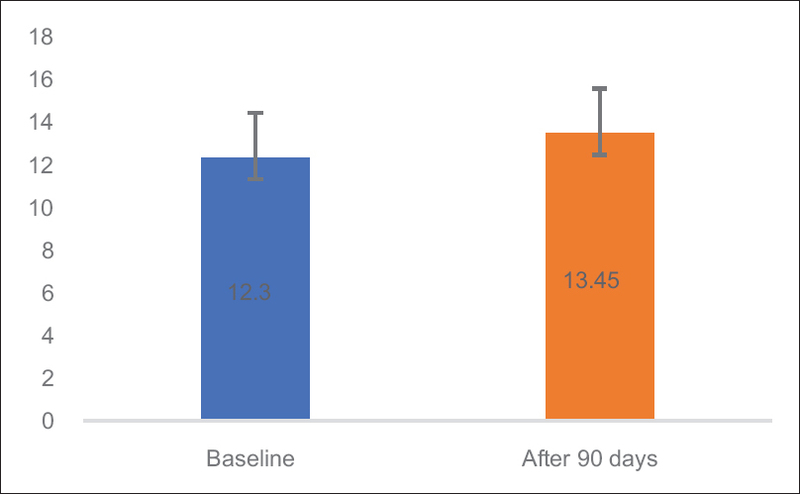 We identified the data of postmenopausal female patients (≥60 years of age) who had visited the Madhavbaug Hospital in Khopoli in Maharashtra, suffering from CHF and having an ejection fraction of <40. Those patients who were administered HFRT twice over a span of 7 days while they were admitted in the hospital were considered for the study. These patients were then followed up, and then, the variables were assessed on the 90th day of HFRT initiation. The cases were identified, and data were assessed from the medical records of the hospital. 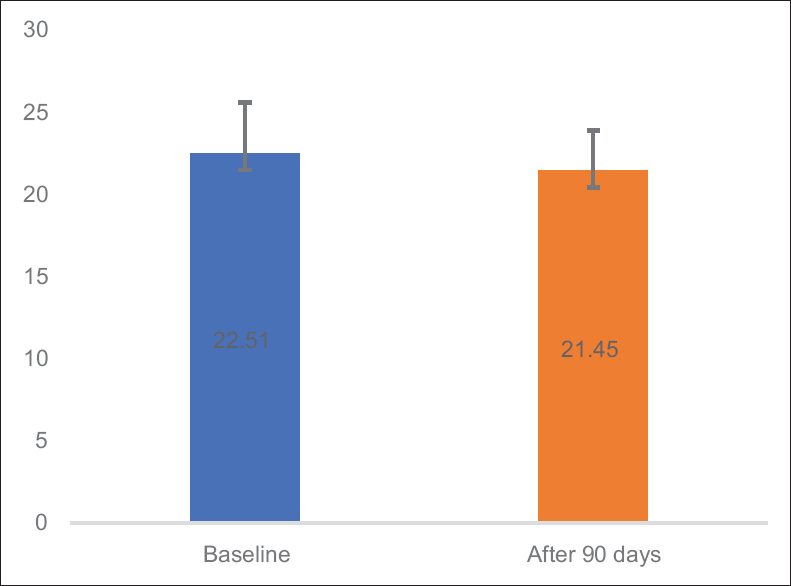 The selection was based on the availability of complete relevant baseline data (day 1) and final day data (day 90 of HFRT initiation) of the patients. The variables assessed on day 1 and day 90 of HFRT initiation included VO2 max, distance covered in 6MWT, weight, BMI, abdominal girth, HR, SBP, and DBP. The patients who had followed a diet plan of 800–1000 kcals over the hospitalization duration were considered. The HFRT is a combination of Panchakarma and allied therapies. HFRT uses various decoctions and oils and constitutes of a 4-step procedure, as described in [Table 1]. On the 1st day of HFRT, the patients endured cardiac stress testing by the modified Bruce protocol. Their maximum workload was calculated in terms of metabolic equivalents (METs), which signifies an easily understood method of stating the energy spent on physical activities as a multiple of the resting metabolic rate. The MET was multiplied by 3.5 to give the peak VO2 max, which is the maximal aerobic capacity. This process was repeated on the 90th day of HFRT initiation, to calculate VO2 max. The distance walked during the 6MWT was assessed on day 1 and day 90 of HFRT initiation. The BMI for day 1 and day 90 of the patients was evaluated by assessing the weight and the height from the medical data records of the postmenopausal female patients and using the formula: weight in kilograms/(height in meters)2. The abdominal girth of the patients was measured on day 1 and day 90 of HFRT initiation, and the means were compared. Similarly, the baseline and the 90th day readings of HR, SBP, and DBP were noted down from the medical records of the patients in the study. Data were entered and coded in Microsoft Excel spreadsheet. R Version 3.4.1 software was utilized to analyze the data. Categorical data were denoted in the numeric form and continuous data were presented in the form of mean ± standard deviation; the paired t-test was used to evaluate the difference between baseline values and day 90 values after HFRT treatment and graphs were used to represent the assessed parameters. The present study enrolled a total of 20 postmenopausal female patients who fulfilled screening criteria [Flowchart 1]. The mean age of the patients was found to be 64.2 ± 4.38 years and the mean height was 151.95 ± 7.66 cm. The mean ejection fraction was 29.55 ± 2.55. More than 50% patients were having past medical history of diabetes mellitus and hypertension (HTN). Demographic characteristics of the patients enrolled in the study have been summarized in [Table 2]. 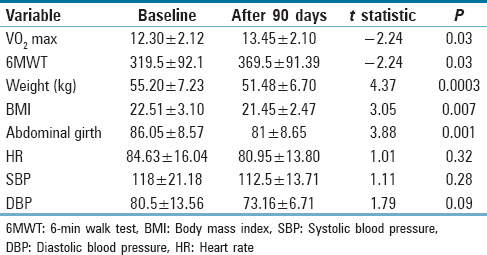 Clinical parameters were compared between baseline values and after 90th day, as shown in [Table 3]. The maximum amount of oxygen consumption, measured as VO2 max, was significantly improved after 90 days of treatment (12.30 ± 2.12 vs. 13.45 ± 2.10 ml/kg. min, P = 0.03) [Figure 1]. After 90 days of treatment initiation, there was significant improvement in distance walked during 6MWT (319.5 ± 92.1 vs. 369.5 ± 91.39 m, P = 0.03) [Figure 2]. The weight (55.20 ± 7.23 vs. 51.48 ± 6.70 kg, P = 0.0003) [Figure 3], BMI (22.51 ± 3.10 vs. 21.45 ± 2.47 kg/m2, P = 0.007) [Figure 4], and abdomen girth (86.05 ± 8.57 vs. 81 ± 8.65 centimeters, P = 0.001) [Figure 3] of the patients were significantly reduced after 90 days of initiating treatment. SBP (118 ± 21.18 vs. 112.5 ± 13.71 mm Hg, P = 0.28) [Figure 5], DBP (80.5 ± 13.56 vs. 73.16 ± 6.71 mm Hg, P = 0.09) [Figure 5], and HR (84.63 ± 16.04 vs. 80.95 ± 13.80/min, P = 0.32) [Figure 5] were reduced after 90 days of treatment but the reduction was not statistically significant. HFrEF is one of the two functional types of CHF, which is as prevalent as the other type which is HFpEF. Various factors such as HTN as well as metabolic disturbances are found to increase the risk of HFrEF. There has been an increase in the developed pharmacological agents for managing HFrEF in the last 2 decades, but there remains a need for newer therapeutic options to improve the outcome of the patients. Menstruation was found to have a cardioprotective effect, and thus, menopause was found to be associated with high risk of CVDs like CHF. Publications have stressed on the association between menopause and CHF although there is less understanding on the underlying mechanisms. Menopausal hormone replacement therapy has not been reliably shown to decrease these risks. Hence, there is a need of new therapeutic options which can help the menopausal patients tackle CHF, especially HFrEF which has a worse prognosis. Increase in body weight and fat deposition, which is seen after menopause, is associated with increased risk of CVDs as well. HFRT is an Ayurvedic intervention involving Panchakarma and allied therapies. It has been utilized by Ayurveda physicians to manage patients of CHF, but their usefulness in the postmenopausal population had not been specifically assessed. Hence, we decided to evaluate the effect of HFRT on various cardiovascular parameters such as VO2 max, distance covered after 6MWT, SBP, DBP, and HR as well as on metabolic parameters such as weight, BMI, and abdominal girth. We found that there was a significant increase in the VO2 max and the meters walked on 6MWT at the end of 90 days of HFRT treatment in postmenopausal patients of HFrEF. VO2 max indicates the maximum rate of oxygen consumption, which is measured during exercise. An increase in VO2 max with HFRT indicates an improvement in the cardiorespiratory function and aerobic fitness. The 6MWT delivers a valid valuation of functional performance in patients with chronic cardiopulmonary disorders, like HFrEF. Identical to VO2 max, an improvement in the meters walked on 6MWT indicates a betterment of cardiorespiratory functioning. The mean values of HR, SBP, and DBP of the patients were reduced in all the patients but not significantly (P > 0.05). These mean values were anyway in the normal range at baseline, and hence, a nonsignificant reduction does not hamper our overall findings. 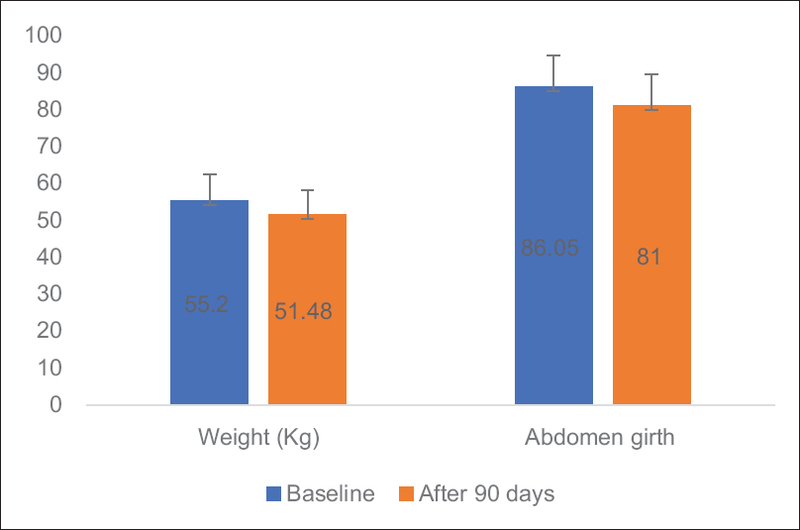 The metabolic variables which were weight, BMI, and abdominal girth were significantly reduced after 90 days of HFRT treatment. Obesity is associated with an augmented risk of multiple cardiometabolic factors which contribute to CHF. The prevalence of obesity has increased more in women as compared to men. Abdominal girth is a variable which indicates the presence of central obesity. A significant reduction in BMI, weight, and abdominal girth indicates improvement in metabolic factors and hence a reduction in the cardiometabolic risk as well. HFRT consists of Snehana (external oleation or massage), Swedana (passive heat therapy), Hridaydhara (decoction dripping therapy), and Basti (per rectal drug administration) which probably act in unity to improve the parameters in patients with CHF. In heart failure, especially in those with reduced ejection fraction, there is a decrease in the cardiac output and an increase in the workload which proportionally increases the oxygen consumption of the left ventricle. The heart fails to cope with the increasing demand and does not rise proportionately. This causes an increase in aerobic energy uptake and hence a decrease in left ventricular efficiency. There is a need to maintain the oxygen demand of the body and the failing heart, especially in HFrEF where there is systolic dysfunction. It has been hypothesized that Snehana may decrease the sympathetic activity, causing a decrease in the vascular tone. Swedana causes sweating which may be leading to peripheral vasodilation and ultimately a reduction in the systemic vascular resistance. The afterload ultimately decreases along with the reduction in the cardiac workload. A rise of body temperature due to passive heating also elevates the cutaneous vascular conductance leading to an increase in systemic conductance. Hridaydhara causes mental as well as physical relaxation of the patient, thereby leading to beneficial effects on the cardiorespiratory parameters. According to a research involving obese patients, Basti alleviated the immune responses by regulating the pro-inflammatory cytokines, immunoglobulins, and functional properties of T-cells. These modifications are associated with a reduction in the body weight, which is sustained for a long time. This finding may explain the beneficial effect of Basti in patients with HFrEF. Our study had a few limitations. We only considered postmenopausal patients of HFrEF; the other functional type was excluded. Furthermore, this was a single-center pilot observational study having a small sample size. Future studies can be planned at multiple centers with a cohort design and a larger sample size to create more solid evidence for HFRT use in postmenopausal HFrEF patients. HFRT improved cardiorespiratory functional parameters of VO2 max and distance walked on 6MWT in postmenopausal patients of HFrEF. The metabolic parameters of weight, BMI, and abdominal girth were also significantly decreased by HFRT. 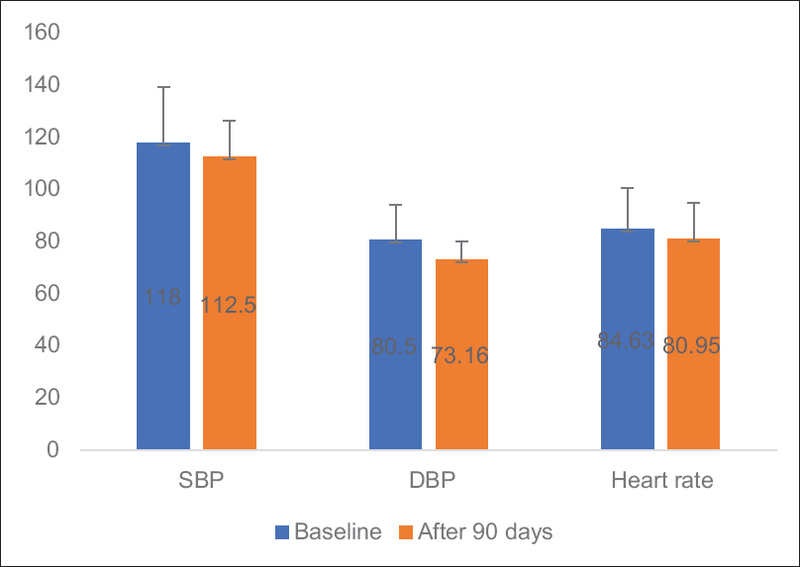 The decrease in the HR, SBP, and DBP by HFRT was not statistically significant in these patients. The authors thank the study participants and their families, without whom this study would not have been accomplished. We are thankful to Dr. Jagdish Hiremath, Chair Professor of Madhavbaug Institute of Preventive Cardiology, Chair of Maharashtra University of Health Science, Nashik for guiding us through this concept and data analysis. This study was financially supported by Vaidya Sane Ayurvedic Education and Agricultural Research Trusts. Celermajer DS, Chow CK, Marijon E, Anstey NM, Woo KS. Cardiovascular disease in the developing world: Prevalences, patterns, and the potential of early disease detection. J Am Coll Cardiol 2012;60:1207-16. Roger VL. Epidemiology of heart failure. Circ Res 2013;113:646-59. Huffman MD, Prabhakaran D. Heart failure: Epidemiology and prevention in India. Natl Med J India 2010;23:283-8. Inamdar AA, Inamdar AC. Heart failure: Diagnosis, management and utilization. J Clin Med 2016;5. pii: E62. Moayedi Y, Kobulnik J. Chronic heart failure with reduced ejection fraction. CMAJ 2015;187:518. Tiller D, Russ M, Greiser KH, Nuding S, Ebelt H, Kluttig A, et al. Prevalence of symptomatic heart failure with reduced and with normal ejection fraction in an elderly general population-the CARLA study. PLoS One 2013;8:e59225. Dunlay SM, Roger VL, Redfield MM. 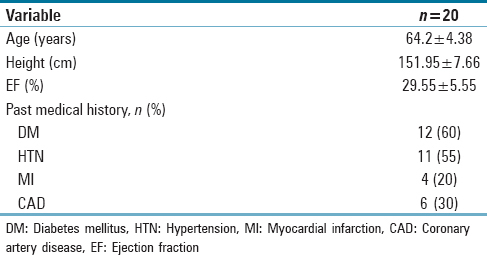 Epidemiology of heart failure with preserved ejection fraction. Nat Rev Cardiol 2017;14:591-602. Bagga A. Age and symptomatology of menopause: A case study. Obstet Gynaecol Today. 2004;10:660-6. Miller VT, LaRosa J, Barnabei V. Effects of estrogen or estrogen/progestin regiments on heart disease risk factors in postmenopausal women. The postmenopausal estrogen/progestin interventions (PEPI). Trial the Writing Group for PEPI Trial. JAMA 1995;273:199. Dosi R, Bhatt N, Shah P, Patell R. Cardiovascular disease and menopause. J Clin Diagn Res 2014;8:62-4. Yamamoto A, Horibe H, Mabuchi H, Kita T, Matsuzawa Y, Saito Y, et al. Analysis of serum lipid levels in Japanese men and women according to body mass index. Increase in risk of atherosclerosis in postmenopausal women. Research Group on Serum Lipid Survey 1990 in Japan. Atherosclerosis 1999;143:55-73. Tchernof A, Calles-Escandon J, Sites CK, Poehlman ET. Menopause, central body fatness, and insulin resistance: Effects of hormone-replacement therapy. Coron Artery Dis 1998;9:503-11. Hilal-Dandan R, Brunton L, Goodman L. Goodman and Gilman's Manual of Pharmacology and Therapeutics. New York: Mcgraw-Hill; 2014. 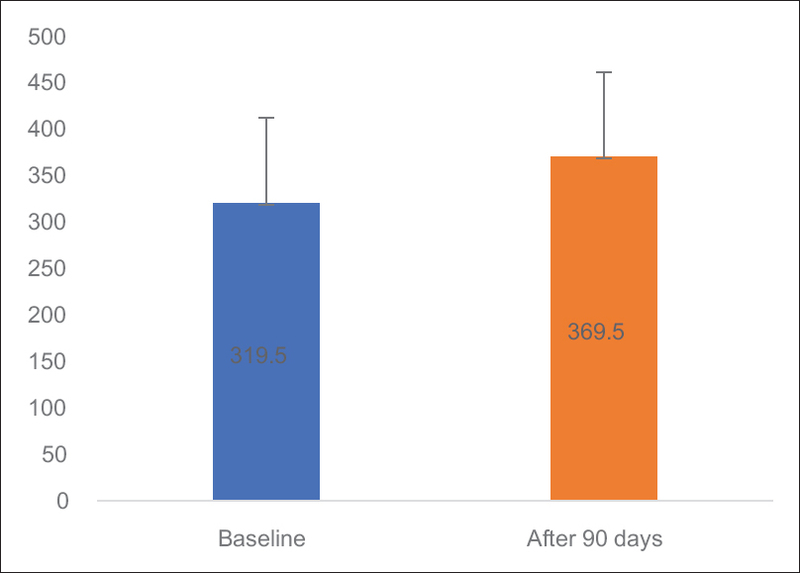 Sane R, Aklujkar A, Patil A, Mandole R. Effect of heart failure reversal treatment as add-on therapy in patients with chronic heart failure: A randomized, open-label study. Indian Heart J 2017;69:299-304. Jetté M, Sidney K, Blümchen G. Metabolic equivalents (METS) in exercise testing, exercise prescription, and evaluation of functional capacity. Clin Cardiol 1990;13:555-65. Bloom MW, Greenberg B, Jaarsma T, Januzzi JL, Lam CS, Maggioni AP, et al. Heart failure with reduced ejection fraction. Nat Rev Dis Primers 2017;3:17058. Scott NS. Understanding hormones, menopause, and heart failure: Still a work in progress. J Am Coll Cardiol 2017;69:2527-9. El Khoudary SR, Shields KJ, Janssen I, Budoff MJ, Everson-Rose SA, Powell LH, et al. Postmenopausal women with greater paracardial fat have more coronary artery calcification than premenopausal women: The study of women's health across the nation (SWAN) cardiovascular fat ancillary study. J Am Heart Assoc 2017;6. pii: e004545. Arena R, Myers J, Williams MA, Gulati M, Kligfield P, Balady GJ, et al. Assessment of functional capacity in clinical and research settings: A scientific statement from the American Heart Association Committee on Exercise, Rehabilitation, and prevention of the council on clinical cardiology and the council on cardiovascular nursing. Circulation 2007;116:329-43. Rasekaba T, Lee AL, Naughton MT, Williams TJ, Holland AE. The six-minute walk test: A useful metric for the cardiopulmonary patient. Intern Med J 2009;39:495-501. Pou KM, Massaro JM, Hoffmann U, Lieb K, Vasan RS, O'Donnell CJ, et al. Patterns of abdominal fat distribution: The Framingham heart study. Diabetes Care 2009;32:481-5. Li C, Ford ES, McGuire LC, Mokdad AH. Increasing trends in waist circumference and abdominal obesity among US adults. Obesity (Silver Spring) 2007;15:216-24. Lombardo TA, Rose L, Taeschler M, Tuluy S, Bing RJ. The effect of exercise on coronary blood flow, myocardial oxygen consumption and cardiac efficiency in man. Circulation 1953;7:71-8. Rowell LB, Detry JR, Profant GR, Wyss C. Splanchnic vasoconstriction in hyperthermic man – Role of falling blood pressure. J Appl Physiol 1971;31:864-9. Thatte U, Chiplunkar S, Bhalerao S, Kulkarni A, Ghungralkar R, Panchal F, et al. Immunological & metabolic responses to a therapeutic course of Basti in obesity. Indian J Med Res 2015;142:53-62.